For the second monument in succession, Paris-Roubaix was won by a noted sprinter who opted not to sit back and wait for a sprint finish. 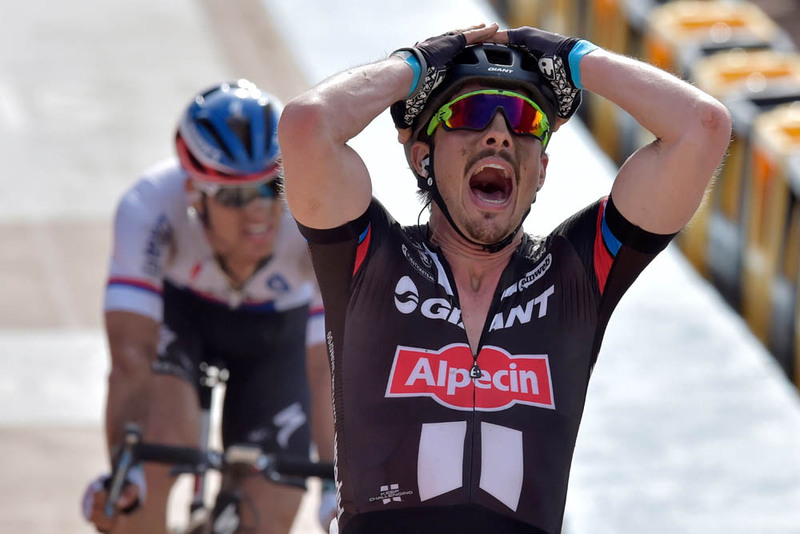 Like Alexander Kristoff (Katusha) in the Tour Flanders last week, John Degenkolb (Giant-Alpecin) responded to what he deemed to be too dangerous a move to let go, and then used his sprint to win from what would more accurately be called a breakaway group than the peloton. Every rider would like to have a quick kick at the finish. The vast majority of races come down to some kind of sprint, and the likes of Juan Antonio Flecha would have built up far bulkier palmares if only they could have travelled just a few kilometres per hour quicker in the final couple of hundred metres. But, as is so often the case in cycling, being too good at something can actually turn out to be a hindrance. Much like trying to win a game of Monopoly after Christmas dinner against a hoard of hostile family members, bike races can be very hard to win if everyone is suspicious of and unwilling to work with you. Quick sprinters seeking to get into breaks have it especially hard – no-one wants to work hard to ensure a break’s survival only to see a sprinting specialist surge ahead at the finish line. That was the case in last year’s Paris-Roubaix, when Degenkolb’s presence in the lead group was enough for Omega Pharma-QuickStep to send Niki Terpstra up the road rather than put their faith in Tom Boonen and Zdenek Stybar for the sprint. Terpstra went on to win, while the German had to be content with second. The moment he’s referring to is when he set off in pursuit of the leading duo of Greg Van Avermaet (BMC) and Yves Lampaert (Etixx-QuickStep). Just as impressive as the power he produced to bridge this gap was his intuition to recognise that this pair had made the decisive selection. After all, the moment at 12km to go when Van Avermaet and domestique Lampaert attacked together on a non-cobbled section hardly felt like the race-winning move – the accelerations from Lars Boom (Astana) moments before and Niki Terpstra (Etixx-QuickStep) on the Carrefour de l’Arbre looked more dangerous. But after the gap had crept to ten seconds, Giant-Alpecin responded. First domestique Bert De Backer was sent up the road in what initially appeared to be an attempt by the team to mark the move – an unusual choice given how useful he’d been to Degenkolb riding alongside him. But everything fell into pace when Degenkolb broke out of the peloton and latched onto De Backer’s wheel, used his teammate’s slipstream for a breather, before accelerating alone again and catching the leading duo with just 6km to go. 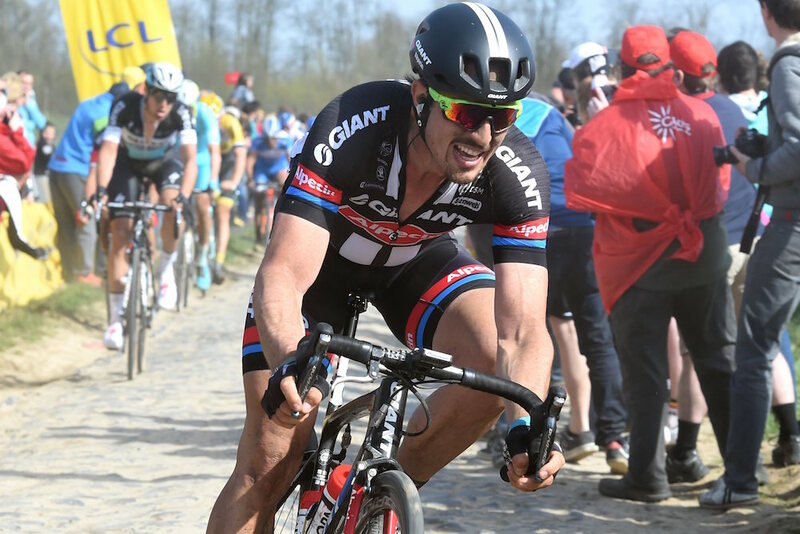 By now Degenkolb was committed, and didn’t bother remonstrating with Lampaert’s understandable refusal to take turns at the front. As the best sprinter of the three, the onus was on him to do most of the work (Van Avermaet took some turns), although Lampaert’s astute tactical choice did allow Etixx teammate Stybar to catch up to the group, shortly followed by Boom, Jens Keukeleire (Orica-GreenEdge) and Martin Elmiger (IAM Cycling). As has been the case so often this spring, Etixx therefore had a numerical advantage, but this time were left with too little time to make the most of it. Stybar joined the lead group with just 3km remaining, and needed to recover from the effort of bridging over on his own. Lampaert attempted one attack but was immediately shut down, and before Etixx knew it they were on on the Roubaix velodrome with Degenkolb third in line being led out by their two riders. From that position his victory was never in doubt. Given how strong Degenkolb was in the finale and the fact he avoided any kind of bad luck, in hindsight perhaps the only way to have beaten him would have been to isolate him. 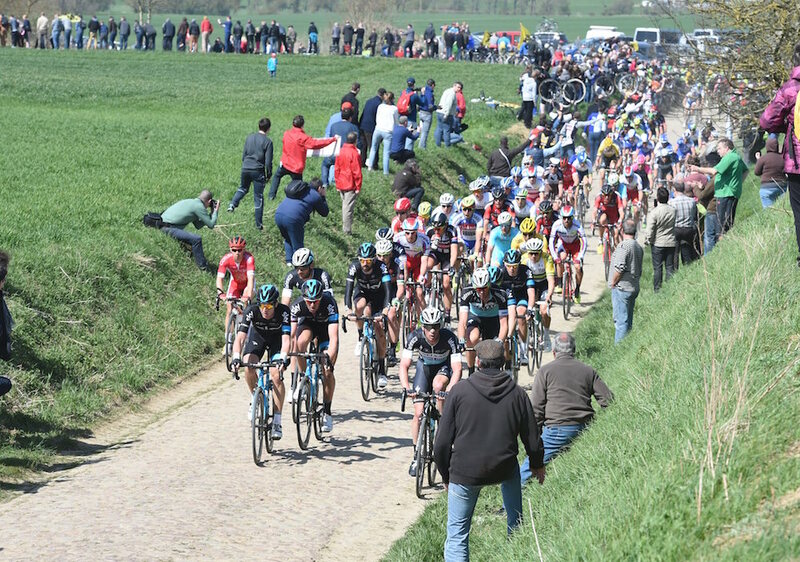 This was a Paris-Roubaix characterised by a lack of selections though, with the usual secteurs of pavé failing to force splits as much as usual – a group of around 20 remained together after the Carrefour de l’Arbre, a secteur that usually obliterates the race into various groups of three or four. As a result, Degenkolb always had teammates around him, most notably De Backer, who helped him cover every dangerous-looking move. There were several committed attacks that attempted to force a selection – Peter Sagan (Tinkoff-Saxo) accelerated on secteur 11 just over 50km from the finish while a crash behind him exacerbated the splits, and Bradley Wiggins’ attack on secteur seven some 20km later threatened to break the race apart – but on every occasion the race came back together. Most notably, an ambush from Etixx-QuickStep on secteur 14 dropped many riders, and when they continued to push on as the road turned into some crosswinds it looked as though the race’s crucial moment was in motion. Degenkolb made the split with many of the other favourites, but with a total of five Etixx riders in the break the race would have swung dramatically in their favour. Once again, though, everyone had caught back on 10km later. Whether it was because of the favourable tailwind, an unusually evenly-matched field or the absence of usual perpetrators Tom Boonen and Fabian Cancellara, the expected selections were never made, and the group of seven that contested the finish was the largest since 1997. They were circumstances that certainly suited sprinters – although Degenkolb, by riding on the front foot like Kristoff and Boonen before him, proved himself to be so much more than just that.